Our naturally infused Cotswold Gold cold pressed rapeseed oils are available in seven varieties; lemon, dill, chilli, smoked, garlic, basil and rosemary. Choose any 3 infusions to make up your pack! All our infusions can be used in the same way as the original Cotswold Gold oil to give a fresh dimension to your food – dressings, marinades, roasting, frying, baking etc. You can even try mixing infusions together to create even more interesting flavour combinations. Have you also tried our sophisticated Cotswold Gold oil with White Truffle? 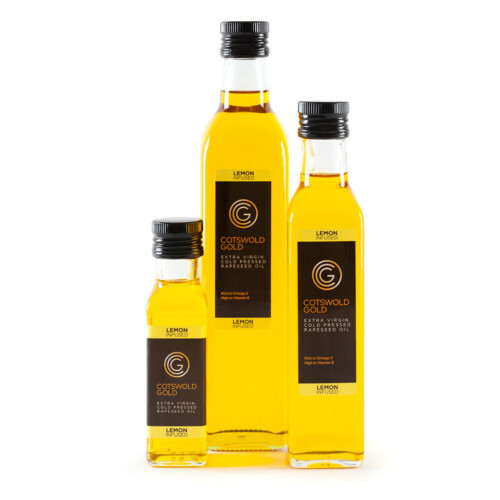 Cotswold Gold Rapeseed Oil Infusions 3 Pack 100ml bottles. Our naturally infused Cotswold Gold cold pressed rapeseed oils are available in seven varieties; lemon, dill, chilli, smoked, garlic, basil and rosemary. Choose any 3 to complete your pack. Basil – With a characteristic Italian aroma, our basil infusion can be enjoyed in a variety of ways. Chilli – Our Chilli infusion gives warmth to a dish without being overpowering. Dill – Our Dill infusion has a delicate fresh flavour that is great with fish and salads. Garlic – Our Garlic infusion is as flavoursome as fresh garlic, minus the chopping! Lemon – Our Lemon infusion is citrus fresh and full of zest! Rosemary – Our Rosemary infusion adds a garden fresh taste to meat and vegetables. Smoked – Our Smoked infusion is deep and distinctive adding depth of flavour to dishes. These infused oils are wonderful. Great for cooking and dipping – we just wouldn’t be without them, since we first tasted them at Abergavenny food festival last year. Highly recommended! We received a 3 oil set as a gift (garlic, smoked, chilli) & I highly recommend them. They have a strong flavour and can be used as a dressing or to cook with and can be used on their own or combined to very good effect. I highly recommend the garlic and smoked infusions. We purchased these at Moreton Agricultural Show during the summer and have very much enjoyed using them. We love the smoked flavoured oil and the dill adds a lovely dimension to all sorts of foods. All of the flavours are good and the rapeseed oil is light yet carries the authentic infusions well we think. A great change to our use of olive oils. So we ordered some for Christmas presents! Look good, fast delivery and well packed. Fab! Really impressed with these infusions and will be reordering soon.